Glamorous city girl Hannah Ford wasn’t thinking when she walked out of a Christmas party and drove three hundred miles into a snowstorm; she just needed to escape. Thankfully local carpenter Sam Taylor comes to her rescue, and the unlikely pair are forced to spend a snowed-in Christmas together. All Sam planned for Christmas was to get drunk alone. The holiday has always been something to be endured, until Hannah tumbles into his life, making it magical. 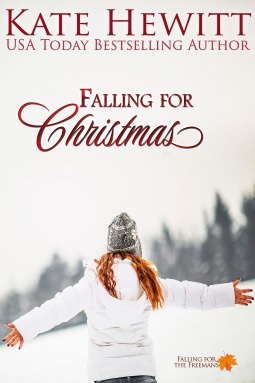 Now Hannah and Sam have a chance to have a Christmas together… and make it the best one either of them have ever had. But can one night out of reality turn into something that’s lasting and real? What’s it like when your heart’s has never experienced true love pure love without strings. Not even that of a parent's? Hannah Ford had been raised in the heart of Manhattan by single oh so professional mother. Who was very aware of style, weight, and the financial standings her daughter would need to meet. So at a very young age harped about her maintaining her size 6 clothing. Not to mention there wasn’t one holiday that they ever celebrated unless they were attending a party her mother could network. As on the night Hannah had decide to take an unscheduled 300 mile road trip. You see she was attending a Christmas weekend party at Eloise’s home at her country estate on the Hudson River. She is the editor of “Rustic Living’s.” Hannah sometimes does still photography work for her. The thing is Blake, Hannah’s ex-fiancée, showed up with his new girlfriend and made a point to introduce her to Hannah. At that point it is when she started noticing that people she worked with and those that were those she thought were her friends were whispering and staring. That’s when she realized she didn’t have to stay and take such behavior. Or look at Blake’s smug looks. She got her suitcase and left. Hence the drive. Only she hadn’t realized that she had driven 300 miles until she was seeing signs that she was now close to the Canadian border and she had no passport. Plus she was in a snow storm moving into blizzard like conditions. When she looks up and sees a sign for “Creighton Falls.” It makes her think of “It’s a Wonderful Life” and decides to get off at the last minute. She takes it to sharp, fish tails, and corrects it but the off ramp is too steep the only thing that really stops her is the snow at the end of it and she is facing a field. When she looks around she sees nothing but snow. No lights anywhere and the snow is coming down faster. She decides to save gas on the rental and turns it off. Then realizes how fast it starts to freeze inside of it. She was dressed for a party, in a dress and heels. She reaches in the back for her wool jacket and well nope this city girl is going to freeze to death. She is not prepared for the wilderness the only wilderness she knows is Central Park. When she decides to get out and look around instantly wet not good! When she sees headlights coming her way. She flags them down. Huge guy gets out offers a ride. She is so scared but Sam Taylor gets her suitcase and offers to take her to the B & B. When they get there it is closed tighter than a drum and he remembers they are in Australia visiting their daughter. No other place to go but his place. She doesn’t like it and he knows it. He tells her he will open the door turn on the lights, come back to the truck she can go up to the room and lock herself in if it will make her feel better. But he has such kind eyes and has been so kind to her she says no and follows him in. They had exchanged glances and smiles because it was uncomfortable for them both. You see Sam is a very private person. He has lived in the home he is in his whole life. It used to be a farm until they had to sell off some of the land. He is a carpenter by trade but is also an accountant. He loves his town but there’s hurt there behind his eyes and smile. Hannah finds herself wanting to know why. Not to mention she wants to share too. Very sweet simple cozy Christmas story. Dealt with relationship issues in a neat and clean way that added to the dimensions of the story. I give this 5 stars. Provide by netgalley.com. Follow us at: www.1rad-readerreviews.com.